All of this started late Thursday afternoon. She was limping and lifting her right rear leg. We initially thought it might be a sprain so we gave her an aspirin and decided to call the vet early the next morning. At 2 am we awoke to her whimpering as she was trying to stand so my husband picked her up and brought her outside to do her 'business'. There were 6 inches of snow on the ground at that time and the snow was still falling. I watched from the window as she hopped around on three legs to find her 'spot'. She eventually 'hopped' out of sight so I waited by the door for her. I waited 10 minutes and didn't see her return so I started to worry. Our property is thickly wooded with forest behind our home and it was anyone's guess as to where she was. I put on my boots and coat and headed outside to find her. Thankfully with the snow I was able to follow her tracks and see my way with the contrast of white from the snow. She ended up hopping her way into the woods and I found her laying down. My husband picked her up and brought her inside. Later that morning we called the vet and got an appointment for later that afternoon as we figured the roads would be relatively safe to travel (we got a total of 15 inches of snow so there was a lot of clean up work). 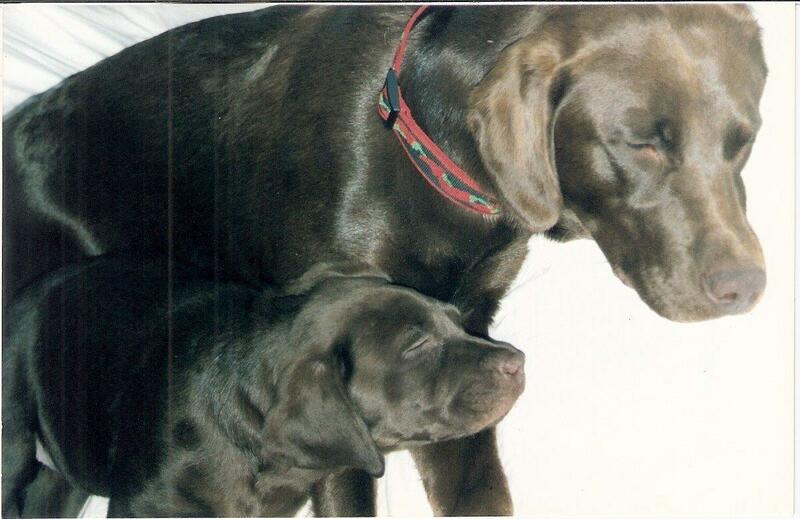 with Java as a puppy. The vet was great at explaining to us and our boys what was going on with Java in kid friendly terms. We looked at Java's x-ray and learned that she had arthritis in her spine and a pinched nerve as a result of the arthritis in her spine. Because of her age and condition an operation was out of the question. The only option was steroids to help her pinched nerve and we would see how she was on Monday. Of course Monday arrived and there's no improvement. Something I'm saddened by but understand as she is 14 yrs old. I've been eating a lot during the last several days for comfort due to stress and sadness. As I sit here typing our beloved family dog Java lived her last day and will be forever missed. She is a 14 year old chocolate lab and is one of two family pets (our other dog is Mocha). Her last days were spent being lavished with attention and food. My husband went out and bought a steak and grilled it for her. I gave her lots of dog cookies smothered in peanut butter. We wanted to keep her as comfortable as possible and gave her lots of loving attention. The phone call was the hardest thing to do this morning. Making an appointment to have a friend and family member euthanized is by far the hardest emotional experience I've ever had in my 40 1/2 years of life. We are all sad and the last few days have been difficult. My 7 yr old was crying on and off this weekend and he made the decision to go with us to see Java euthanized. The vet that we brought her to was very kind. She gave Java one shot to sedate her. While she was sedated we had our time and privacy to say goodbye. The second injection was what stopped her heart. It was a peaceful passing. She is no longer in pain. I have so many memories of her over the past 14 years. My husband and I got both our dogs when we were living together before marriage and kids. 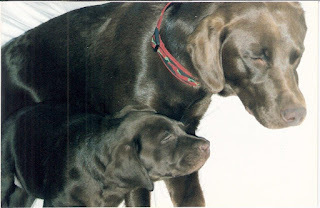 I tell my boys that our girls Mocha and Java were mommies first babies with four legs :-). Java's character was very unique. Besides her 'stuffed animal like' soft silky coat she was a dog that was the eternal puppy that often had a 'dear in the headlights' kind of look in her eyes. She also had 'a tail that wagged the dog'. Her body wiggled seemingly uncontrollably when we would come home. 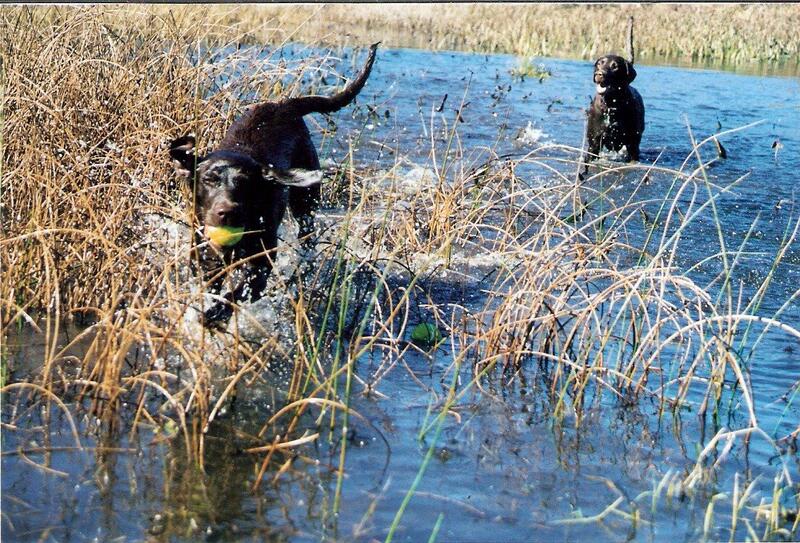 She also loved to play fetch and swim. 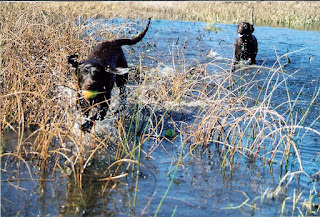 She was a dog that loved to dive to the bottom of streams, lakes, and ponds looking for rocks. She was a 'scuba dog'. It was a behavior she learned on her own. She would surface dive and come out of the water with a rock the size of her head. Many times the rock was so heavy her rear legs would lift off the ground as she pranced her way out of the water with her new found treasure. She was also known as the escape artist in the family. The funny part about being an escape artist is she had a very unassuming expression. She had an 'empty headed look' in her eyes but she was our little Houdini. She escaped from every pen we ever put her in (The Invisible Fence we finally ended up getting is 100% dog proof ). 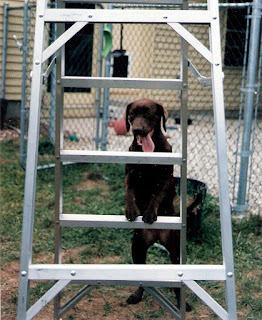 Besides digging under a fence she could also scale a chain link fence and jump over the top as she got close to the top rail. 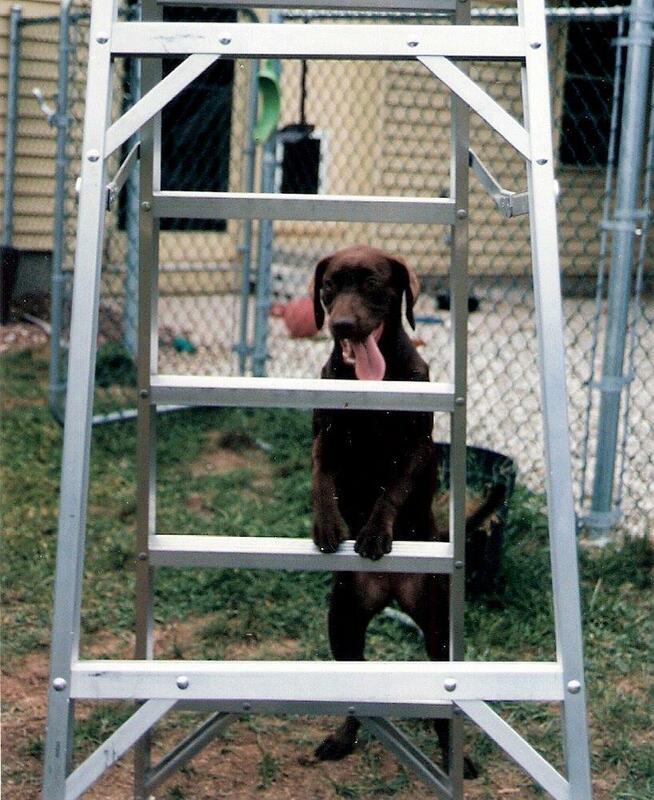 She also had the talent of being able to climb a latter and would retrieve anything via hand command, verbal command or by whistle in any terrain or environment. 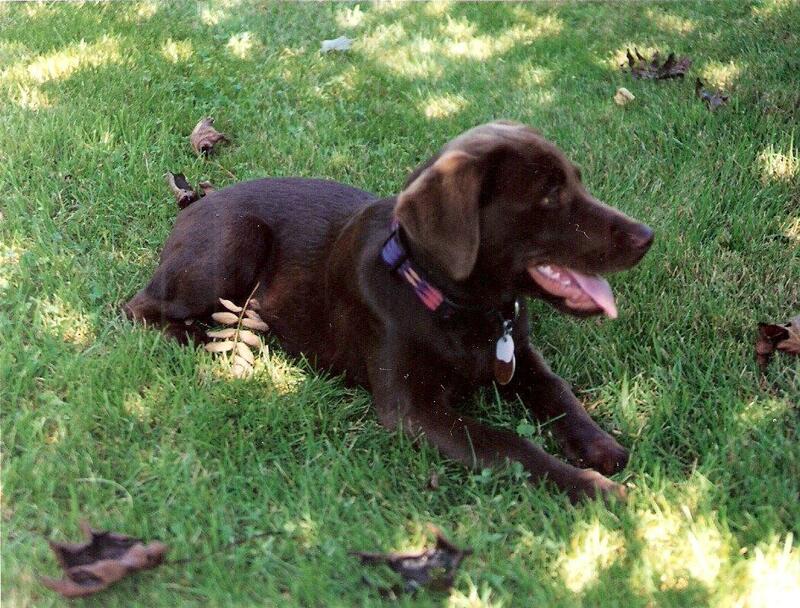 One of the funniest memories I have of her is she shredded one of our coffee table books: 101 Uses For A Lab. 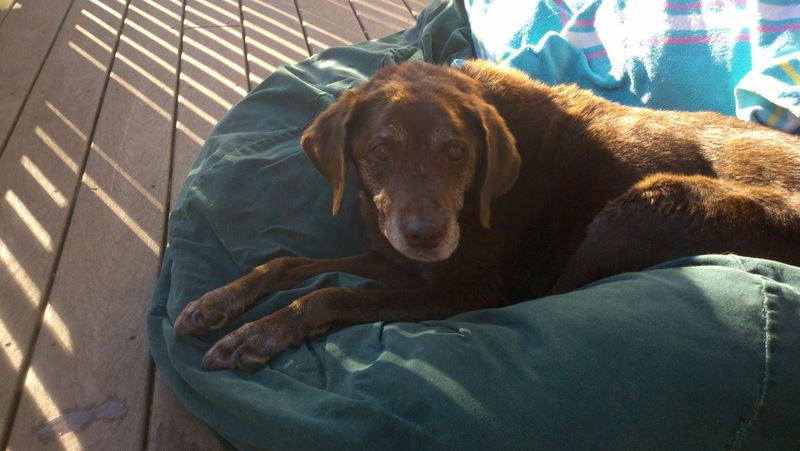 She was a 'one of a kind dog'. 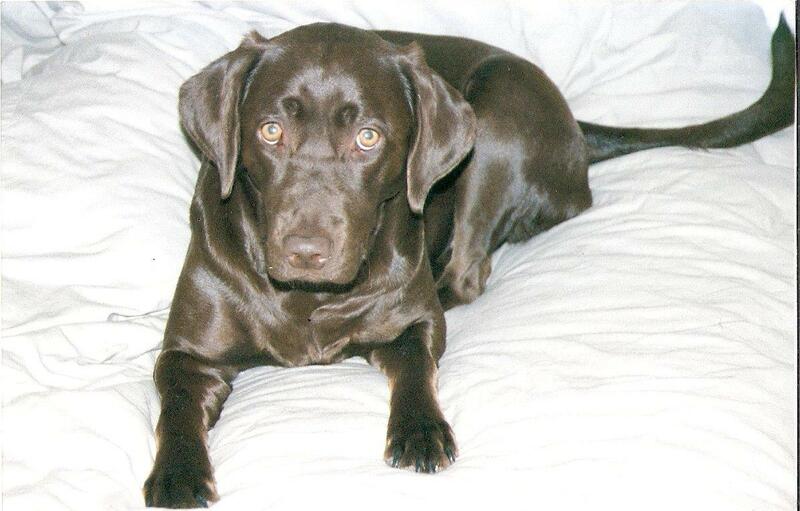 Other mischief she used to get into was digging holes in my garden and eating flower bulbs that I planted. Nothing seemed to be off limits when it came to her appetite. Probably the most odd thing she ever ate was gypsum board. She dug and clawed at the walls in the finished basement of the duplex we lived in years ago. She almost made it to the neighbors on the other side. I can only imagine what our neighbor was thinking when he heard grinding and scratching on the other side of the wall. I had visions of her one day making it through and popping her head out the other side. Kind of like Jack Nicholson in the movie The Shinning. Needless to say my husband and I became experts at patching gyp board. One other odd thing she ate (along with her accomplice Mocha) was a cantaloupe. I purchased a cantaloupe and placed it on the counter for safe keeping (so I thought). When I went to go slice it up I couldn't find it anywhere in the kitchen. I did however find the evidence in the living room. No rind and no stains or juice on the carpet just three little seeds. Last but not least she had an odd but funny behavior of licking feet. Every night she would go into my sons room and lick his feet - something my 7 yr old enjoyed and now misses at bedtime. Our first born enjoying Mocha and Java. The house is more quiet and a little less lively now. I have memories of her mixed in with a boat load of sadness. I never realized how sad it could be to lose a family member and a friend of the K9 variety. When we first had our dogs I had in the back of my mind what it would be like when they were gone and I would get choked up. It's something that I'm sure every dog owner thinks about and is the one downside of dog ownership. Knowing that someday you are going to have to say goodbye. 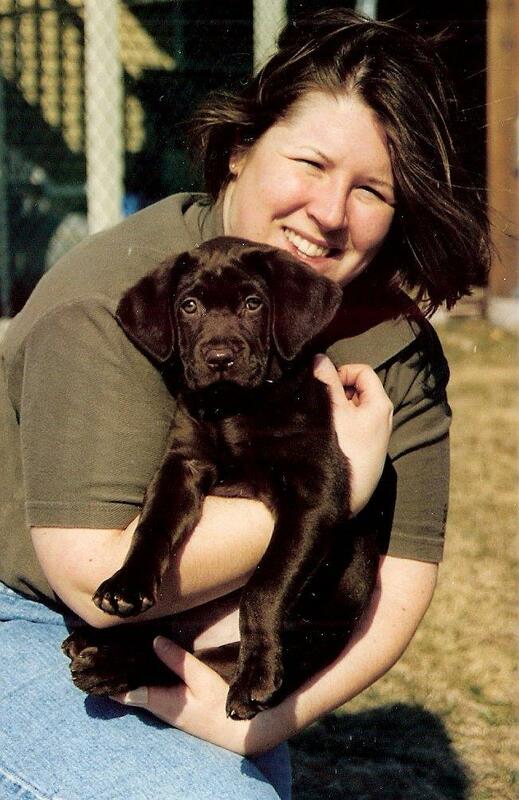 Goodbye to a friend that has been there for you unconditionally for many years and was always there to greet you when you come home with their tail wagging uncontrollably while they sing to you in a dog like whimper because they are so excited to see you. Anything can happen in a moment of time and I feel like I'm in a state of disbelief that everything seemed to happen so quickly from the time she fell ill to the time she passed away. In about a week we will be able to pick up her ashes that will be in a pottery urn with an impression of her paw on it. I'm looking forward to getting it to bring home. A few positive things things I can gather from this experience is the strength and love of my 7 yr old and of my husband. My 7 yr old opted to be with Java in her last moments and of course cried and was sad but in a very mature way (our 3 yr old wasn't emotionally mature to handle witnessing it in my opinion). We were there together crying and holding one another. Getting through that painful moment as we will continue to do so as time passes on. My 7 yr old has Java's funeral planned and wants to have a family party in her honor and wants to decorate a stone to put in our garden because he said it would be beautiful. In addition he wants to put together a memory board with pictures of her for display at the party. It's only been a short time since Java's passing and my 7 yr old is very upset at times and finds moments of difficulty in school as he feels overwhelmed with sadness (much the way I've been feeling along with my husband). I'm so lucky to have amazing sensitive children that are ok with expressing their emotions and sadness. We will always love her and miss her. Our friend, our family member, our lovely, lively Java. Our memories of her will be with us always.